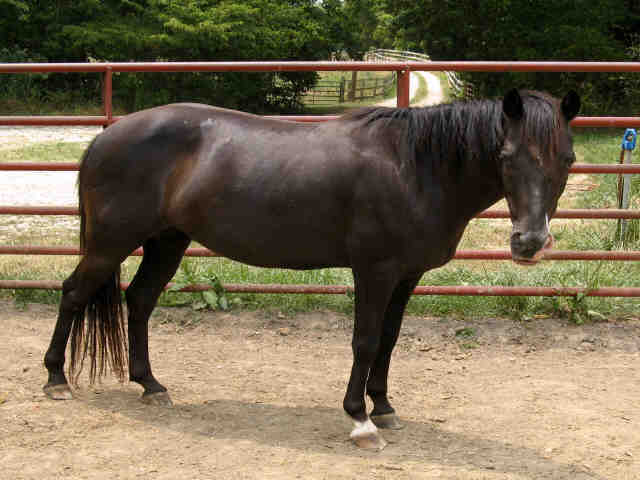 This black beauty is Amelia, a Pony of America / Appaloosa cross horse. She's currently calling Longmeadow Rescue Ranch home and is available for adoption. Shelter staff believe she's about 9 years old. Amelia stands 13 hands 2 inches. According to shelter staff, Amelia had a rough start. When she came to Longmeadow, she had a head wound that was untreated and she had a skull fracture. Her owners id not provide the medical care she needed and Amelia was seized under warrant. Custody was awarded to the Humane Society of Missouri after a disposition hearing. After removing her from the property with the assistance of the local Sheriff's Department, Amelia was taken by Longmeadow employees to the vet. The wound was treated and Amelia has completely healed, though she does have some white hairs on her head that mark the spot of her wound. Shelter staff report that Amelia is a very sweet girl. She has been ridden by a beginner ride and a seven year old child at Longmeadow Ranch. She listens very well and is calm natured. Amelia is large enough for a small adult or would be a good children's horse.